Add a rustic touch to your dinner table with this Brown Better Homes and Gardens Roaming Elk 16-Piece Square Dinnerware Set. 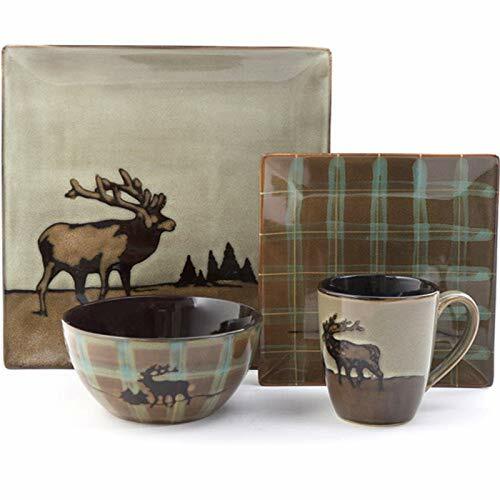 This ceramic reactive glaze dinnerware set features a square shape with an attractive elk design. It comes with four dinner plates, four salad plates, four bowls and four mugs. Easy to wash up, this stoneware set can be washed in the dishwasher, and all the pieces are also microwave safe. If you have any questions about this product by Better Home and Gardens, contact us by completing and submitting the form below. If you are looking for a specif part number, please include it with your message.